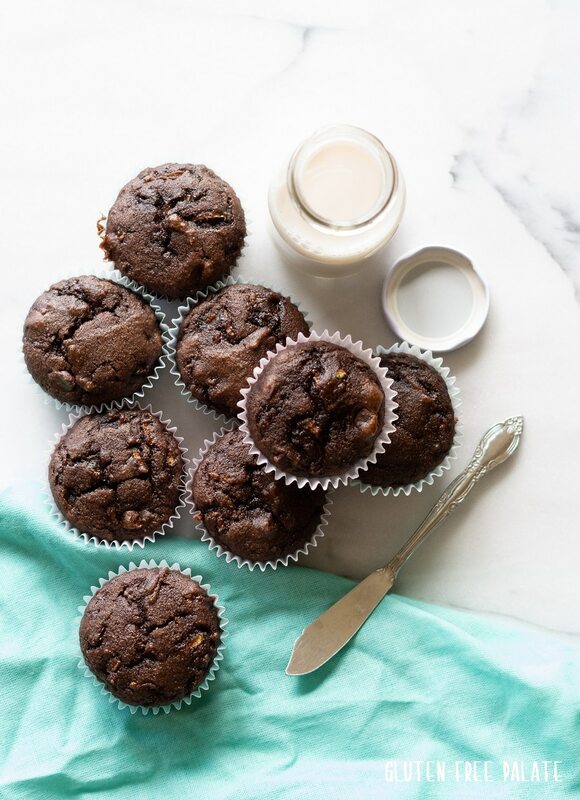 Grain-Free Chocolate Zucchini Muffins that are gluten-free, dairy-free, and Paleo friendly. These muffins are tender, chocolaty, and perfect for breakfast or snack. 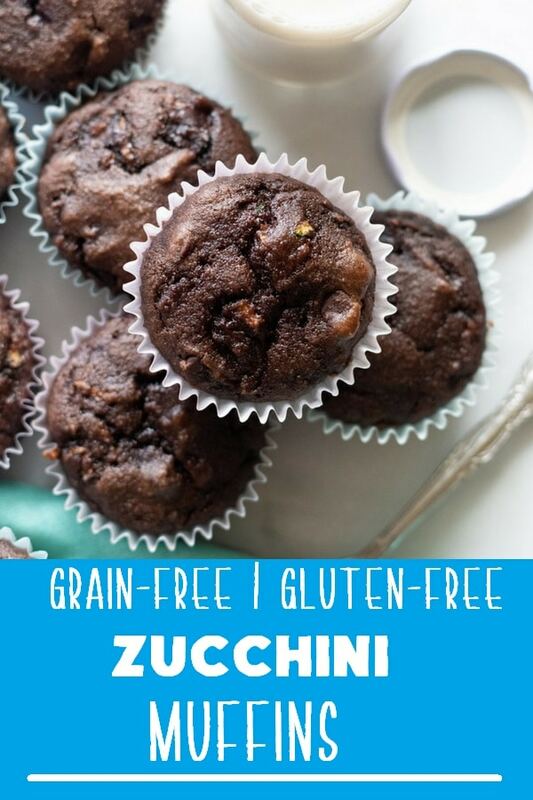 If you are a fan of zucchini bread and chocolate you are going to love these scrumptious Grain-Free Chocolate Zucchini Muffins. They are tender, have a slight crumble, and perfectly balanced with wholesome ingredients and CHOCOLATE. 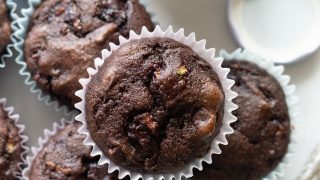 This recipe is another variation from my Paleo Chocolate Chip Muffins, which are one of the top made recipes here at Gluten-Free Palate. They are incredibly simple to make, delicious, and nutritious. Zucchini lovers would say that these are a perfect paleo zucchini muffin. Do I need to squeeze the liquid from the shredded zucchini before I mix it in? In many recipes you do need to because of the added moisture. 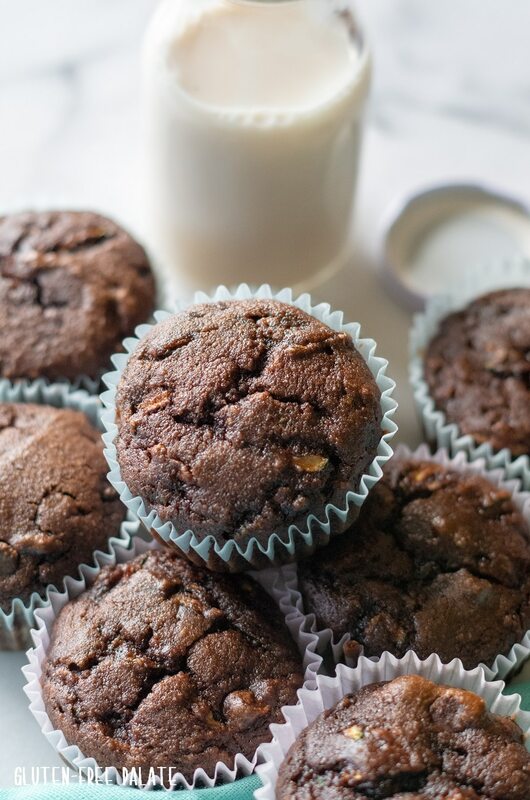 This grain-free chocolate zucchini muffin recipe doesn’t use a lot of zucchini and it works well with the added moisture, so no need to remove the access liquid. Simple grate your zucchini and stir it into the batter when called for. When you make zucchini muffins do you peel the zucchini? Nope. Just make sure you give your zucchini a good rinse to remove any dirt. Zucchini peels are soft and grate super easy so you don’t have to remove the peel when you are making zucchini bread or muffins. Preheat oven to 350°F (180°C). Line a cupcake pan with 12 paper liners; set aside. In a large mixing bowl, whisk almond flour, cocoa, salt, and baking soda. In a separate medium mixing bowl, whisk coconut oil, maple syrup, and eggs. Add the wet ingredients to the dry ingredients and mix until well combined. Stir in the shredded zucchini. Spoon batter evenly into your paper liners. Bake for 20-22 minutes or until the center is set. Remove from the oven and let cool for 5-10 minutes before serving. Store in an airtight container at room temperature for up to two days. Super easy, right? You are going to love these paleo zucchini muffins. What can I use instead of Maple Syrup? You can use honey, agave or a sugar free syrup in this recipe in place of the maple syrup. Just note that the flavor will be different. Maple syrup tends to be mild in flavor while still adding a touch of sweetness. Can I use an egg replacer? I haven’t tried using an egg replacer in this recipe because of the amount of eggs that it calls for. I have had others comment on similar recipes that chia egg and flax egg worked well, but the muffins didn’t rise as much. If you make these grain-free chocolate zucchini muffins exactly as the recipe calls for they will be fail-proof. I haven’t tested these muffins with a lot of substitutions. If you do find a substitution that you like please stop back by and let me know. It helps others that might be looking for the same substitution. I can’t wait for you to try these muffins. You will love how tender they are, the hints of zucchini, and the chocolatey goodness. These muffins hold up for about 48 hours (because of the zucchini). If you can’t polish them off that quickly you can freeze them until you are ready to enjoy them. 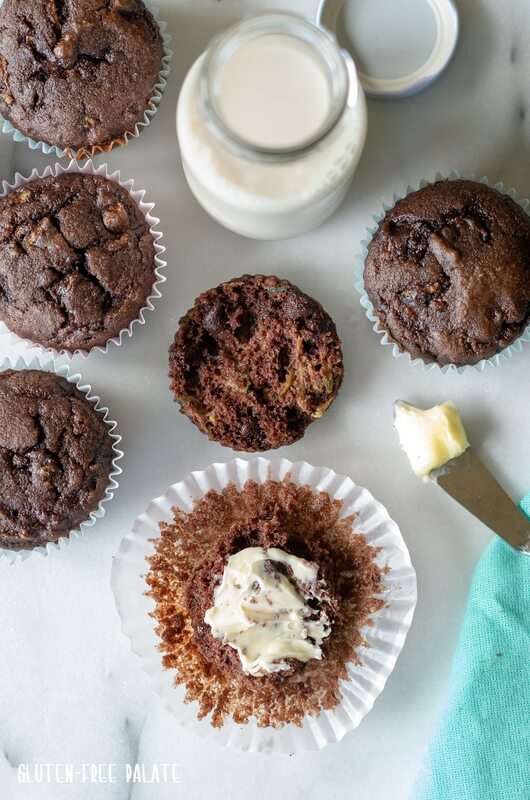 If you make these grain-free chocolate zucchini muffins please stop back by and let me know what you though. I always love hearing from you. Looking for other grain free muffins? You might like my grain-free carrot cake muffins. Looking for a banana muffin? 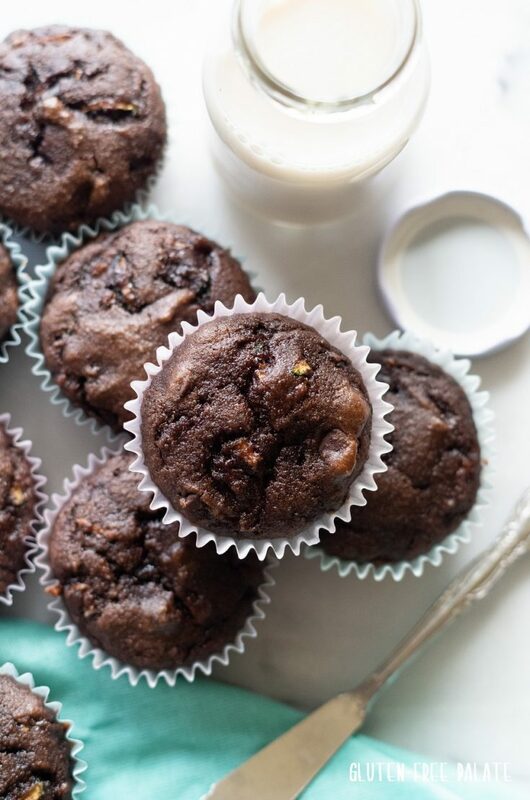 Try these Paleo Chocolate Banana Muffins from Texan Erin. I can’t have almond – is there a substitute for that flour? I subbed 1/2 c coconut flour + 2 baby food pouches, worked great! These muffins are fantastic, I doubled the recipe, cut the oil in half and used a little less then double the syrup and they were perfect. Thanks. I’m so glad you like them. Thank you for letting me know.